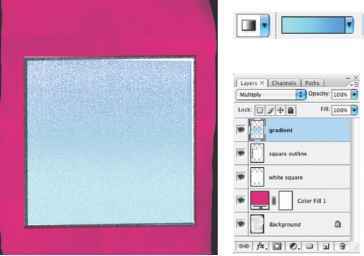 The magic wand tool selects adjacent pixels in an image based on their similarity in color. You'll use the magic wand tool to select the large number "5." The tool options bar contains settings you can change to alter the way a tool works. In the tool options bar for the magic wand tool, the Tolerance setting controls how many similar tones of a color are selected when you click an area. The default value is 32, indicating that 32 similar lighter tones and 32 similar darker tones will be selected. 2 In the tool options bar, enter 70 in the Tolerance text box to increase the number of similar tones that will be selected. 3 Using the magic wand tool, click what looks like the surface of the large number "5" image. Most of it will be selected. 4 To select the remaining area of the number "5," hold down Shift, so that a plus sign appears with the magic wand pointer, indicating that whatever you click will be added to the current selection. Then click one of the unselected areas of the blue number "5." Note: When you use other selection tools, such as a marquee tool or lasso tool, you can also use the Shift key to add to a selection. Later in this lesson, you'll learn how to subtract from a selection. 5 Continue adding to the selection until all the blue areas are selected. If you accidentally select an area outside the blue number, choose Edit > Undo, and try again. 6 With all of the "5" selected, hold down Ctrl (Windows) or Command (Mac OS) and drag the number to the area to the upper left of the book image. 7 Choose Select > Deselect.